Omaha attorney James L. Koley was influential in state, city matters. Published Friday October 4, 2013 Provided with permission from the Omaha World-Herald. Longtime Omaha attorney James Koley died Thursday morning at his home in Houston, where he had retired after a distinguished career in Omaha. His legal work extended into a landmark First Amendment rights case, dozens of private and publicly traded corporations and some of Omaha's stickiest community situations. Koley, 83, had cancer, said his son Patrick of Omaha. Koley had moved to Houston in 2007 to be near his daughter Grace Sickler and her family. Other survivors include son John of LeMars, Iowa; daughter Caroline of Maui, Hawaii; 16 grandchildren; and one great-granddaughter. Koley was born in St. Louis and came as a child to Omaha, where his father, Peter, worked as a plasterer and later for Koleys Inc., a metal plating shop. Jim Koley graduated from Creighton Prep and Creighton University and, in 1954, from Creighton School of Law, becoming a deputy county attorney. He served as general counsel, secretary and vice president for Peter Kiewit Sons' Inc. and served on the board of the Omaha World-Herald Co. for many years. 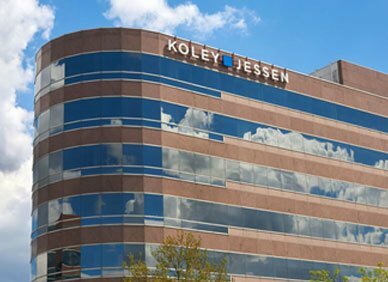 Koley worked at the Fitzgerald Brown law firm and formed McGill Koley law firm and then Koley Jessen law firm with fellow attorney Paul Jessen, who died in February 2012. Later the firm became one of the first office tenants at One Pacific Place, 1125 S. 103rd St.
Koley worked on one of the most significant First Amendment cases, Nebraska Press Association v. Stuart, which still protects the rights of news media to report court proceedings. In 1976, the U.S. Supreme Court unanimously overruled the Nebraska Supreme Court, which had upheld Judge Hugh Stuart's gag order on reporting parts of the Erwin Charles Simants murder case. The state court initially refused to rule on the case, then unanimously upheld Stuart's order after the U.S. Supreme Court — contacted by Koley's legal team — forced the lower court to act. Koley also drafted Nebraska's press shield law, known as one of the strongest in the nation in protecting reporters from having to reveal confidential sources. An annual constitutional law lecture at the Creighton is called the Koley Address, and the school has a professorship and scholarship in his name. Koley was named a fellow of the Nebraska State Bar Foundation in 1997. He was former chairman of Art's-Way Manufacturing Co., a publicly traded farm equipment maker from Armstrong, Iowa, and former chairman of Dover Corp., a diversified manufacturer based in Downers Grove, Ill. In 1991, Koley, a race horse owner, was one of a group of Omahans who were interested in running Ak-Sar-Ben's race track when Douglas County considered acquiring it. “I want to see racing continued in this area, and I'd like to see management of the racetrack involved with people who have the interests of the community at heart, as well as racing, as well as running a program that will have a long-term viability to it,” he said at the time. The track was acquired by Douglas County and later closed because of competition with casinos and dog racing in Council Bluffs. Koley represented some of the people who were drawn, unjustly, into controversy over the failure of the Franklin Credit Union in 1988. The credit union's managers were imprisoned for stealing its assets, but accompanying allegations of sexual misconduct were disproved. Eventually St. Joseph closed and Gross and Roncalli restructured their financing within the Omaha archdiocese. Koley, a longtime parishioner of Christ the King Church, also was chairman of a special gifts committee that was part of a $25 million Catholic schools fund drive in 1990 to construct Skutt Catholic High School.